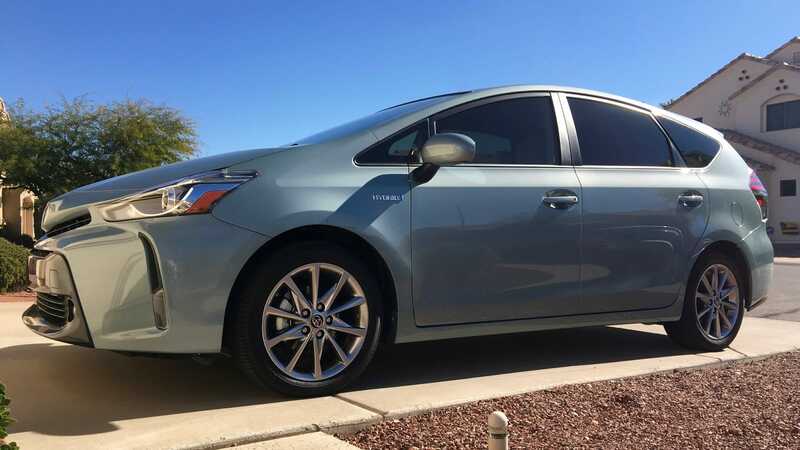 After a 1,000 mile road trip in his new Prius, Nic has thoughts and gripes. I took my new Prius v on a road trip from Phoenix to Los Angeles and back, just shy of 1,000 miles total, and boy do I love this car! I was worried about the lack of power at first, especially since the v (a.k.a. wagon) version has the same power plant as the regular sized Prius but is significantly larger, but it turned out to be fine. Nobody can accuse it of being sporty, but there’s enough power—accompanied by howls of pain from the internal combustion engine—to merge on the freeway and to get back up to cruising speed after red lights. Los Angeles, of course, is a great city to figure these kinds of things out. Not that traffic in Phoenix isn’t bad and annoying, but LA is next-level. Crumbling streets? Check. Too many cars? Check. Deranged sociopaths in traffic? Check. I have no idea how people in LA survive their daily commute. But the point is the Prius v handled it with aplomb. When it comes to the long cruise through the desert, the best thing since sliced bread is what Toyota calls Dynamic Radar Cruise Control. (Every car manufacturer apparently has to name this something different because meetings, but it’s about the vehicle adjusting its speed to match vehicles in front of you when on cruise control.) This makes long hauls so much easier! Turn it on and steer. Done. It feels like magic. Unfortunately Toyota decided to only bundle this with the Advanced Technology Package, which is only available on the highest trim line, so you have to purchase the top-of-the-line Prius to get it. Grr. But it’s worth it. Another nice feature that comes with the Advanced Technology Package is Lane Departure Alert. This makes the car notice when you’re drifting out of your lane. This even worked on LA freeways where the human eye could barely make out the lane indicators, and it’s smart enough to not trigger when you’re using the blinkers. Nice! But Toyota also made some design choices that flummox me. First and most important, you can’t see the hood. Nope. Not at all. You see the front of the dashboard and that’s it, so you have no idea where the hood is. This makes parking in tight spaces interesting. Interesting is bad. The garage door openers are located on the rear view mirror and are not lit at night, so you have to learn to find them by feel—this feels chintzy. On the subject of the rear view mirror, another nice future feature is that it auto-dims at night. You can turn this off for whatever reason—I gave it a lot of thought during the long drive, and I can’t think of a single reason why you’d want to, but you can. So there’s a green light to indicate that auto-dimming is on. A light on the rear view mirror. Which you tend to look at a lot. So at night you have this silly green light right in your vision. 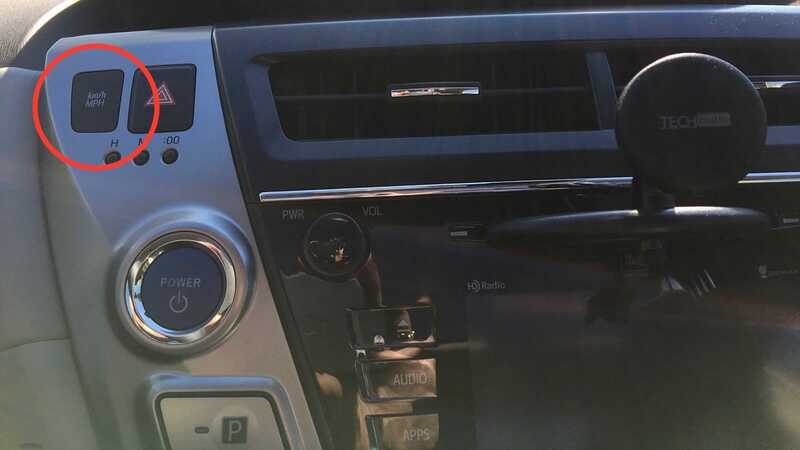 There’s a button on the console to switch between metric and imperial measurements for the car. Right at the top of the console in the most expensive real estate on the entire car. A switch between measurement systems. Who keeps switching back and forth? Why did this particular button earn that place? I’d love to know the thinking behind this. The switch between imperial and metric. Why is it so prominent? And on the topic of the console, sigh, yes, it’s centered. I realize that’s a Prius Thing™, but it’s a dumb thing. It’s different, sure, but it’s not better. There’s a reason every other car has it in front of the driver: It belongs there. But, sure, whatever, it is what it is. Those niggles being stated, I do love this car and applaud Toyota for their forward-thinking.